Saturday dawned to northwest breezes and high clouds, a perfect fall day in Cape May. Birders all over town are going nuts with great numbers of warblers in the trees and raptors migrating overhead, but monarch fanciers are also being rewarded today. We were surprised by good numbers of monarchs swirling over the dunes of Cape May Point, with more seeming to stream in from the north all morning. Roosts are beginning to form already, but today the monarchs seem to be gathering in the conifers -- pines and junipers (also known as cedars) near the dunes. The first flowers of seaside goldenrod have now opened, providing excellent nectar for monarchs along the dunes and on the upper beach. The birds and butterflies agree -- today's a day to be in Cape May. Come and join them if you can. Darn, we missed it by a day. 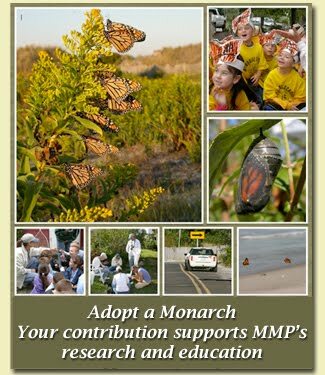 We were in town yesterday and did see some monarchs at triangle park, Lighthouse & Coral. I would have loved to see a roost of them. Next time.... Love your website.